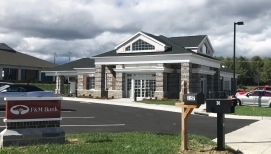 Welcome to F&M’s Myers Corner location in Staunton, “Queen City of the Shenandoah Valley.” Our bank sits on Gosnell Crossing, across from Parrott Orthodontics and 7-Eleven. We are also down the road from Fishersville Family Pharmacy, and convenient for people looking for banks near Fishersville. When you arrive at the Staunton (Myers Corner) bank you’ll find a modern brick and stone building with white trim and plenty of parking surrounding it. We also have a side drive-thru and an ATM. F&M’s presence in the Shenandoah Valley dates back to the early 20th century. Throughout our history we have supported the local communities where our customers and employees live and work. We are proud to take part in the creation of a vibrant economy through our original Perks @Work program, which helps small businesses provide savings and discounts to their employees, and connect with potential customers. F&M’s employees also volunteer time and money to local causes, through our “Casual Fridays for Charity,” which benefits different organizations each month, and events such as the United Way Day of Caring. When you bank with F&M you get all of the services and convenience of the bigger banks, plus options that are rare in today’s banking environment: ATM fee refunds, high interest checking, and debit card cash back. Our knowledgeable employees are here to give you personalized service and help you find solutions to your financial needs and goals. F&M also partners with small businesses to create retirement and insurance benefits for their employees. F&M Bank Corp., our parent company, has ranked 4th out of 13 Virginia banks on the American Banker’s top 200 list of publicly traded community banks. Discover the flexible and professional service that only a community bank can provide.